Australia is renowned for once being home to a group of gigantic birds known as the mihirungs. These birds are distantly related to waterfowl and included the impressive Dromornis stirtoni, the largest bird ever known on the planet at about 450kg in weight. They were around about eight million years ago and the last surviving relative lived into the last 100,000 years in what is termed the Pleistocene. This was Genyornis newtoni, and at 250kg it was still a massive bird, some six times the weight of an emu. It is listed among the megafauna that went extinct after human arrival. Fossil eggshell has been found eroding from sand dunes in widespread localities across Australia. And in the early 1980s, one particular kind – about as thick as that of emu – was noticed to differ from that of emu. It was believed to be Genyornis shell. Thereafter, Genyornis shell became the subject of extensive research by US geologist Professor Gifford Miller and his colleagues. In a series of influential papers, they showed both emu and Genyornis shells were common 300,000 to 100,000 years ago. But simultaneously, across the breadth of Australia, Genyornis shell suddenly disappeared from the record between 50,000 and 45,000 years ago, while emu shell persisted in the record to the present. The extinction of Genyornis became the most well-dated megafaunal extinction in Australia, and one of the best dated in the world. 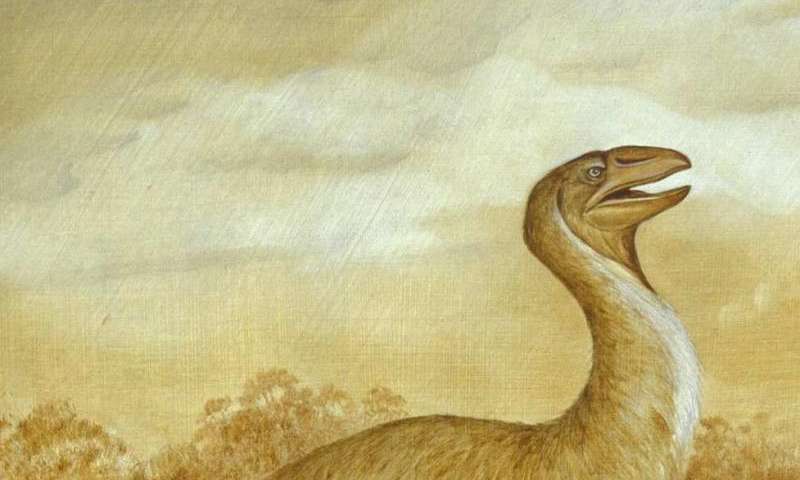 But the discovery of egg shell from a single egg that was expertly reconstructed by Natalie Schroeder in the South Australian Museum hinted at a problem in this story. 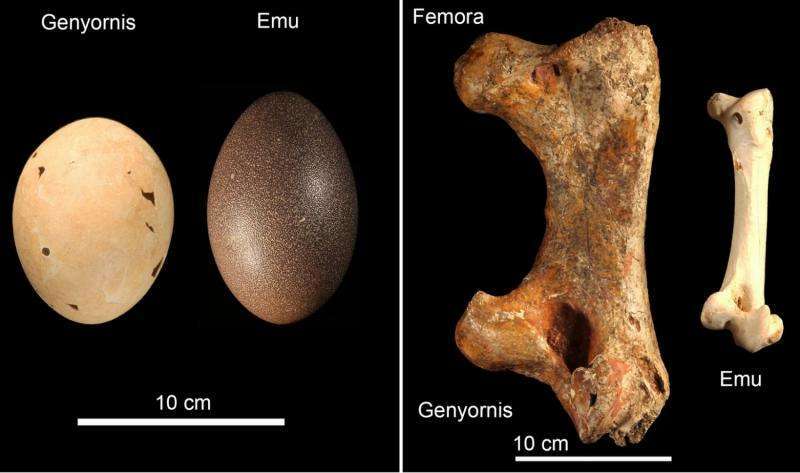 What was thought to be a Genyornis egg actually measures only 126mm by 97mm, about the same size as an emu egg. It is thus three to four times smaller than would be predicted for the bird Genyornis. Even the smallest moa lays a larger egg, and the similar-sized giant moa, Dinornis robustus, laid eggs hugely larger (240mm by 178mm). Our team examined the structure of the so-called Genyornis eggshell and compared it to a range of other fowl, as well as fossil eggshell millions of years old that had to derive from other mihirung species. In a paper, published this month in Quaternary Science Reviews, we show that the putative Genyornis shell differs markedly from older Mihirung shell and was similar to that of land fowl known as megapodes. Megapodes are a unique group of birds that all employ external heat to incubate their eggs. They are called mound-builders, as many species build mounds, some of them very large, measuring more than ten metres wide and three-to-five metres high. In these, composting vegetation provides the heat to incubate the eggs (ectothermic incubation). Others megapodes use warm soil in volcanic landscapes or warm sands in sand dunes. In Australia, the brush turkey (above) is well known in eastern regions for its nuisance value in gardens. In the more arid interior, the malleefowl is another member of this group. Both are among Australia's largest birds at between two and two-and-a-half kilograms in weight. But both are small compared to some little known extinct forms. There are two named species in the genus Progura that probably reach five-to-six kilograms. Australia's Progura species lacked the specialised digging adaptation of the smaller megapodes, but they still had to achieve ectothermic incubation – and what better place for this than the extensive sand dunes across much of the country. We believe the eggshell long attributed to Genyornis is, in fact, the missing shell from these extinct giant megapodes. This neatly explains why shell is very abundant in sand dunes. The implications of this new identity for the egg shell are huge. The most well-known extinction event in Australia is no longer the case. All such inferences on the extinction of the megafaunal mihirung bird now apply to giant (but not really megafaunal) megapodes. Genyornis bones are rare in the fossil record, except in two sites (Lake Callabonna, in northern South Australia, and Cuddie Springs in central northern New South Wales) and when and why it went extinct is now the new problem to address. The relatively large eggs of megapodes and the fact that they buried their eggs has meant that across their entire former distribution (Melanesia, Polynesia and Australia), many species became extinct due to hunting and egg harvesting. That the largest megapodes known should have gone extinct relatively quickly after human arrival is not unexpected. Just how many did is being addressed by ongoing research, as several new species have been detected by researchers in our group at Flinders University. It seems we lost a whole radiation of these giant birds.